Mario Super Sluggers originally released on August 25, 2008 for the Wii with a MSRP of $49.99. The game was developed by Namco Bandai and published by Nintendo. Mario Super Sluggers received an "Everyone" rating from the ESRB with "Comic Mischief" listed as the only content for gamers/parents to be aware of. As I mentioned in my The Legend of Zelda: Twilight Princess post a few days ago, Nintendo just released four "Nintendo Selects" titles this past Sunday for the Wii. Mario Super Sluggers, like The Legend of Zelda: Twilight Princess, is one of the four Nintendo Selects titles that is now available for just $19.99. How many hours have Wii owners spent playing America's favorite past-time with Mario and friends, with 995 days of game-play reported? Let's take a look! data via the Nintendo Channel, not all Wii owners in the United States. Mario Super Sluggers has 361,819 Wii owners that have reported game-play hours through the Wii's Nintendo Channel. 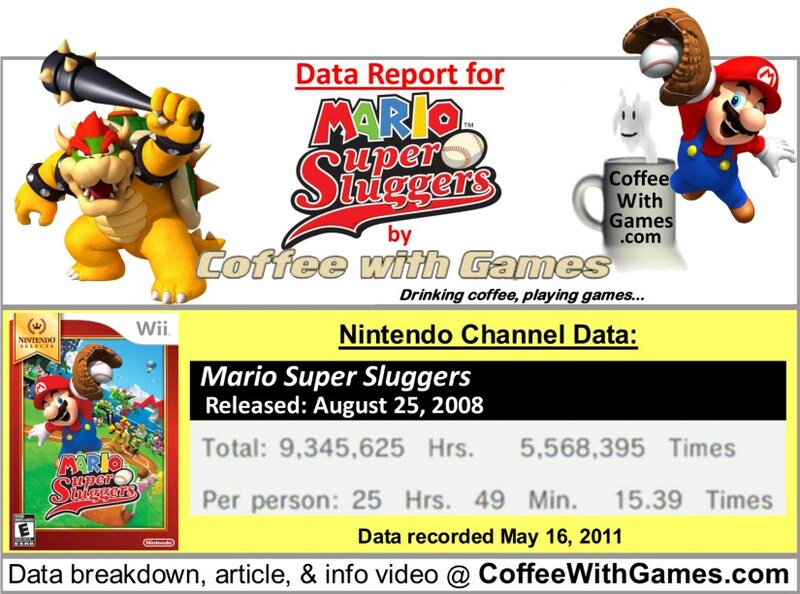 Mario Super Sluggers has 9,345,625 Total Hours of game-play reported, with an average play-time of 25 Hours 49 Minutes "Per person". Mario Super Sluggers' average play-time per session is just over 1 Hour 40 Minutes. Mario Super Sluggers' Amazon.com sale rank is currently #780, and it is selling for $19.99. Nintendo Selects: Mario Super Sluggers' Amazon.com sale rank is #331, and it is selling for $19.99. Sales ranks recorded around 9:00PM on May 20, 2011. Mario Super Sluggers' "professional" review score average is 70.03%, based on 30 reviews on GameRankings.com. The game has a 4.5 out of 5 Stars rating on Amazon.com, based on 78 customer reviews between the original release and the new "Nintendo Selects" release. Mario Super Sluggers' customer review score average is 90.25% when the customer reviews are converted to a 100% review scale. Review score averages recorded around 9:00PM on May 20, 2011. The average length of a Major League Baseball game is right around 3 hours, and a full season is 162 games. Based on the data for Mario Super Sluggers, Wii owners have averaged playing about 8 real-life MLB games. To complete a full MLB season they need about 462 more hours for the overall hours averaged "Per person" than are currently reported, which would be the other 154 games needed for the entire season. I have not played Mario Super Sluggers, and it has been years since I have played a baseball game(Ken Griffey Jr. Presents Major League Baseball is the last one I can recall really playing). Have any of you played Mario Super Sluggers, and if so, would you recommend it to other Wii owners looking for an arcade type baseball game at its new low price of just $19.99? Also, if you have played Mario Super Sluggers do you know about how many hours you have put into the game? Own it. Love it. DEFINITELY recommend it for $20. Do you know if your game-play hours with the game would be close to the reported game-play hours, or do you think you have a lot more/less averaged overall? "We just picked up the mario soccer game for the wii..."
Mario Strikers Charged. I rented it a few years back, and thought it was a lot of fun. It reminded me A LOT of the NHL Hitz games which I really enjoyed last generation, and crazily enough, Mario Strikers Charged's developer also developed one(or two) of the NHL Hitz games. Thank you both for the comments/feedback! If anybody else has any thoughts(or recommendations) for Mario Super Sluggers, feel free to leave a comment.